There’s no doubt about it, travelling can be expensive, for first time travellers it’s easy to underestimate costs and blow your budget. Many people focus just on finding a cheap flight, but that’s not the only way to save money on travel. As a budget travel expert, I prefer to focus on things that are within my control. Travelling is a life experience and sometimes the experiences don’t cost you anything. Labour Day may have marked the unofficial end of the summer, but it’s the start of low season when it comes to travel, so expect to find lower prices on flights and hotels. Flying off peak isn’t the only way to save big, try these money saving ideas on your next trip. Have a budget: Without a proper budget in place you run the risk of blowing your budget before even taking off. I recommend setting a yearly budget and then saving for it on a monthly basis; this way you know how much you have to work with and you can plan accordingly. Does that vacation you want to take go over your budget? If so change your destination or look for other ways to save. Obviously taking a vacation on credit is out of the question so set a budget and stick to it. Try Google Flights: All sites pretty much offer the same price these days, so I recommend using a travel aggregator to save money on travel. Google Flights is your best option here since they list every available flight path and the lowest price associated with it. Stay with Airbnb: Airbnb is a popular hotel alternative that allows travellers to rent directly from the owner. This option isn’t just for budget travellers looking for a cheap room; families or groups of 3+ can rent entire apartments or houses for a fraction of the cost of a hotel. Visit friends and family: If you have friends or family abroad, and they’re generous enough to invite you over then you need to go now! Do not wait. Nothing beats a free stay, so take advantage of these rare opportunities when they present themselves. Get cash at ATM’s: Although you’ll need to pay 2.5% mark exchange and possibly a small fee when using ATM’s, they still offer the best value when getting currency abroad. Banks usually charge closer to 10% when exchanging money, and despite their advertisements; travellers cheques are not widely accepted. Use credit: Sounds odd, but one of the best money saving ideas is to use credit. Most credit cards charge a 2.5% fee when you charge a foreign currency to it. You can avoid this by using a credit card that has no foreign exchange fees, just remember to pay your bill in full and on time. 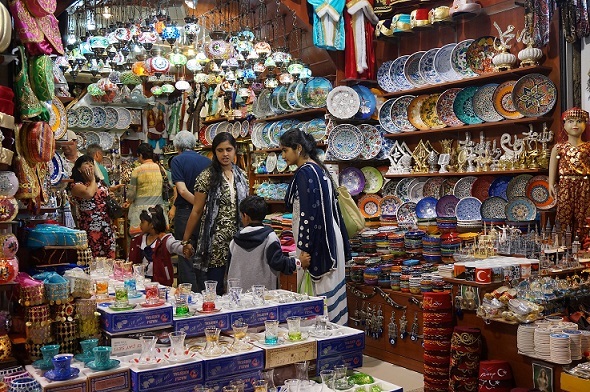 Haggle: If you plan on shopping at markets, especially the ones that cater to tourists then you should be prepared to haggle for a good price. It’s practically a tradition if not a custom to go back and forth on prices with vendors. That being said, all the famous tourist markets around the world are usually huge rip-offs to begin with; you’re better off going to the smaller markets where locals like to shop. Free attractions: Every city in the world has free attractions you can visit, so take the time to research before heading on your adventure. If you need some inspiration try checking out Tripadvisor.ca where they list the most popular attractions in every city. Remember it doesn’t have to be a physical attraction; you can travel like a local just by exploring a trendy neighbourhood. Eat street food: Way too often do I see tourists head to the international fast food chains instead of trying out local foods. This is a huge mistake, if you’re visiting another culture you need to try their cuisine; the best place to do this is at food stalls on the street. Not only are you guaranteed a local experience but street food is always incredible cheap compared to back home. One tip, avoid any vendors where there is an obvious amount of foreigners in line. Go for the vendors which have mainly locals in line, if you don’t know how to order just point at what others are eating, this is a guaranteed meal to remember. Use public transportation: Taxis can be crazy expensive so try to use public transportation when you can. Subways are easy to use; generally speaking you just head in the direction of the last stop of the line. I recommend printing a map of the metro before you depart and be sure to research if there is any kind of unlimited transit passes that would benefit you. Some cities offer an attractions / transportation pass but it doesn’t always offer the best value, so just check out what is included and decide for yourself if it is worthwhile. It’s easy to save money on travel when you know what to look out for. So get out that passport and prepare for your next adventure. Do you have any money saving ideas for travel? If so I’d love to hear them. Follow Mr.CBB… Click the Social Media links below! Any North-American here who can tell me if that’s really a thing in the US/Canada? Travelling like a local now is my favourite thing to do. I used to try to rush around and see every possible attractions but now I prefer a leisurely pace and sit at coffee shops to enjoy things much slower. Having a ForEX free card can save you a ton assuming you use your credit cards a lot when travelling. Great advice! This is almost exactly how Mr. Frugalwoods and I travel abroad. The advantage of using credit cards is a great point that many people don’t realize. So is traveling like a local–we just try to blend in and do as the locals do. It’s almost always cheaper, more interesting, and less stressful since no one realizes we’re tourists and so we’re not hassled as much! AirBnB is a great alternative if you want to visit a place but don’t know anyone there whose place you can stay for a couple of days. I also always try to look for free attractions, and budget my expenses if there are things I *really* want to see but cost money. The outlet malls in Orlando had some of the best deals I’d ever seen. I know encouraging you to shop doesn’t help you save money but the deals were great! Great post Barry! What do you recommend for a credit card that doesn’t charge a foreign exchange fee? I think most if not all of the ones I have charge that 2.5%. These are great tips. The only one I haven’t done/used is Google flights. I know about it, but for some reason I always forget to use it and instead use the same website I’ve always used. I’ll get it some day. Great tips. Yeah, some street vendors have the best food. Another travel tip, avoid airport food and drinks if you can, very expensive! Some of the best meals I’ve ever had in my life came from street vendors. Most recently a fish sandwich by Galata Bridge in Istanbul. And you know what, I’m REALLY excited about the “free days” we have planned! Great post, love your tips. Eating street food will save you a lot of money compare to going to a fancy restaurant. Another way is to utilize grocery stores and make sandwiches yourself. Great post! I love traveling like a local and eating street food and from small restaurants. Makes for a fun and affordable vacation!